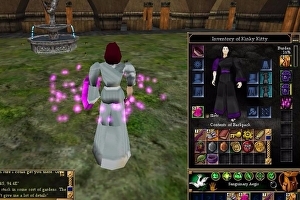 It’s the final weekend of Asheron’s Call. Three days from now, the servers will be shut down, and 18 years of video game history will be lost forever. The servers are quiet. There are a few last players scuttling through the halls, ticking items off their bucket list before the world is lost forever. I’m here to tick something off myself, too: the Shard Vigil Memorial, located on the steps of the Ithaenc Cathedral on the Thistledown server. It takes an hour to find it, partially because this is the first time I’ve played the game – I’m using a borrowed account as Turbine have closed down new account registration since they announced they’d be pulling the plug at the end of January – and partly because Crimson Pain, my willing assistant, has no idea how to get to the memorial.